Back to school time is upon us, and everyone is scrambling to get things together last minute, parents and teachers alike. We thought we would show just how simple creating your own stunning posters and graphics for the upcoming school year can be. Many people think to create something worth printing they have to hire a graphic designer and that simply isn’t true. Today there is a myriad of software products and online platforms available that allow everyone to create stunning graphics in just a few minutes. 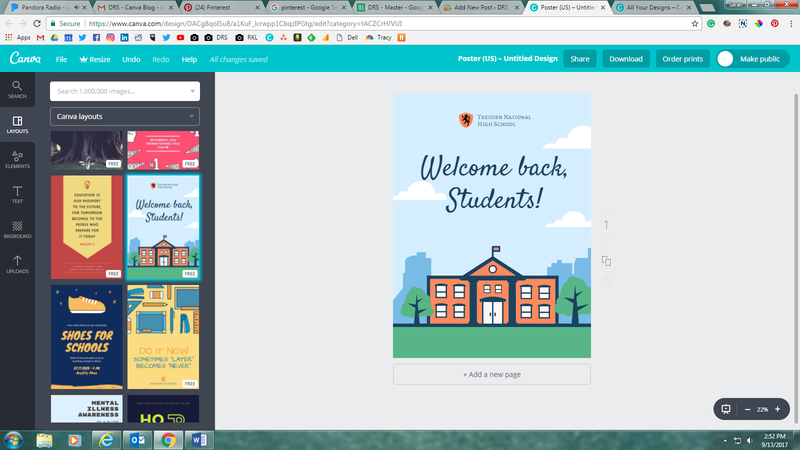 Below we will walk you through the simple process of creating a poster through one of our favorite online platforms, Canva. 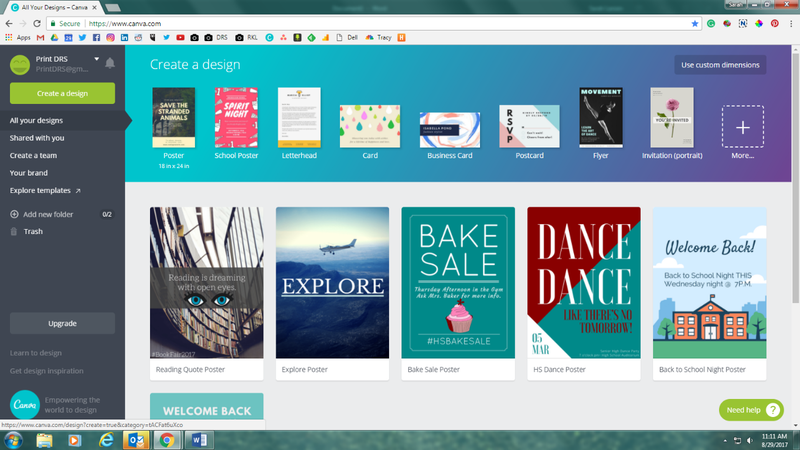 We love Canva because of the simple layout and logical setup which enables everyone to use it. 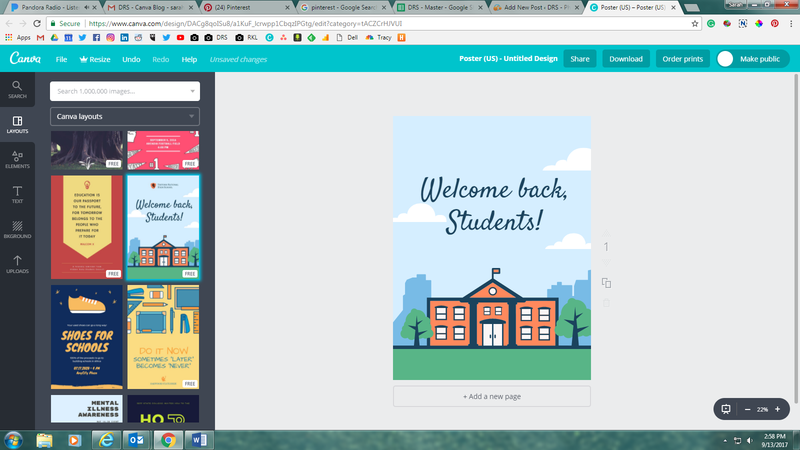 First, go to www.canva.com and create an account. To make it even easier you can create an account through your Gmail or Facebook accounts. Then simply enter your username and password and click the bright green Login Button. This will take you to the home page of the website that populates with all of your previously saved designs. You can either click on one of your old designs to further edit it before printing, or you can create a new design. 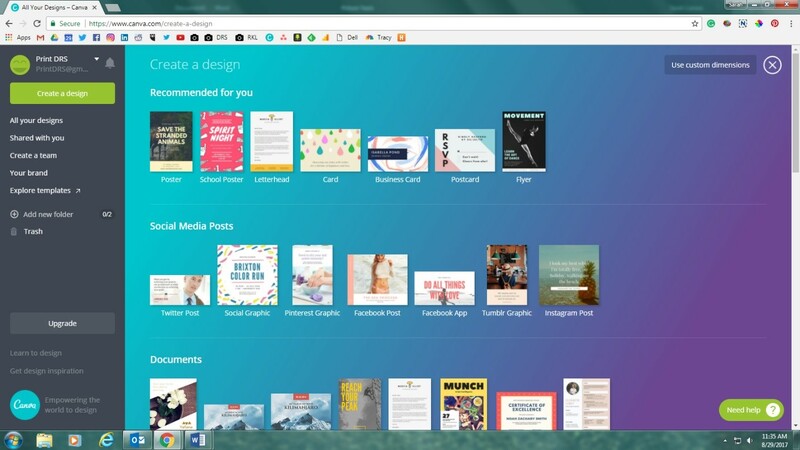 One of the best features about Canva is that they have a list of popular sizes already listed out for you so it is easy to select what you are designing for. Simply click the size image you want to create and it will pop open in a new window. 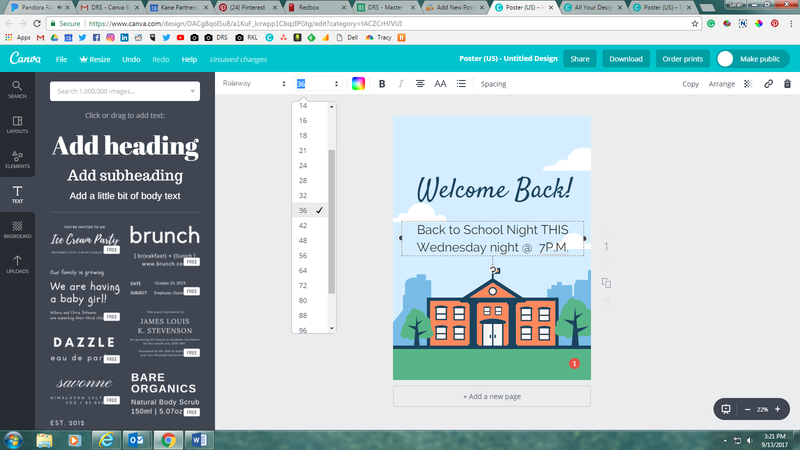 Another fantastic feature of Canva is that they have hundreds of pre-loaded templates available for you to use, so you don’t have to create something from scratch. Simply click the layouts option on the top left and scroll through to find a design you like. Then click the design and it will automatically be added to your blank canvas. Now that you have selected a template you can customize it fully to whatever your design requires. 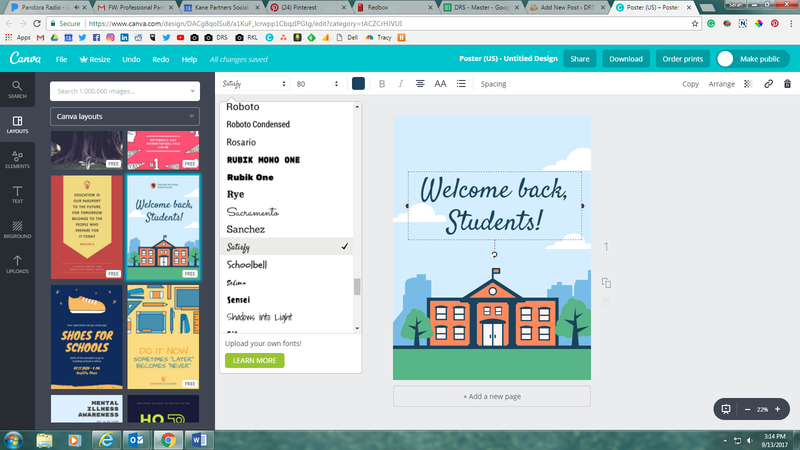 Canva allows you to change the colors, fonts, text, picture, opacity, line height, etc. And they make this editing process intuitive and easy to follow. Just click on the part of the design you want to change and you can begin editing. 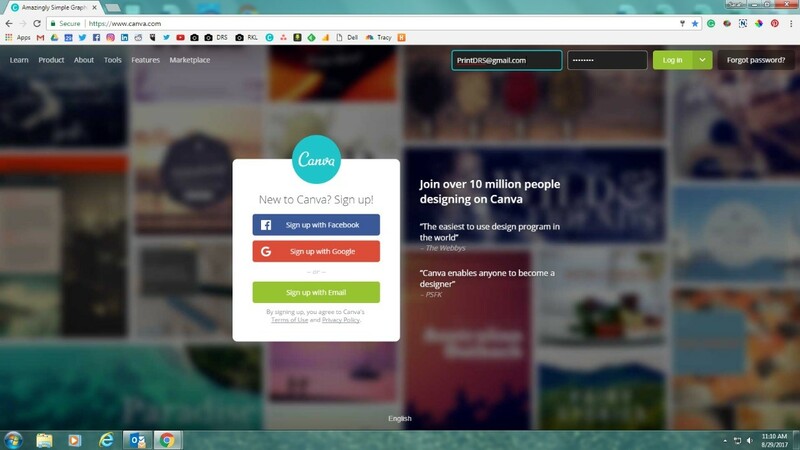 Canva has a number of free photos available that you can use in your design. There is also a handy upload option at the bottom left if you want to use one of your own photos. Simply select the photo you wish to change, drop it into the design, and size the way you wish. You can also change the text and font of your design. So, the contents change but overall the look and feel remain. 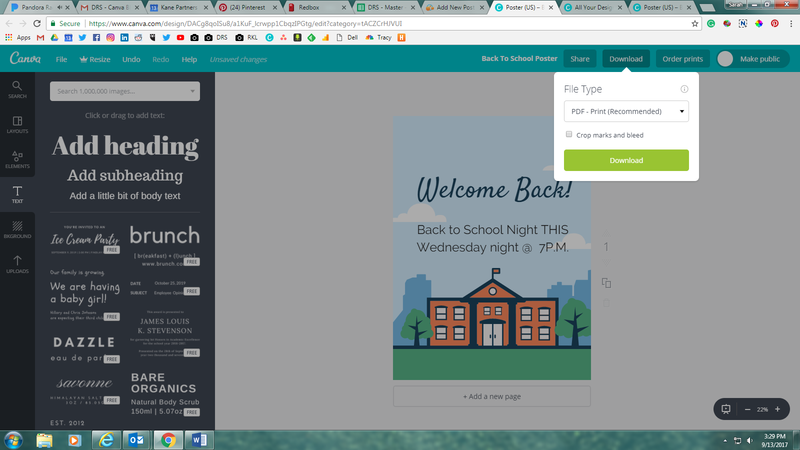 It’s simple to edit fonts, just click the text on the design and then open the drop-down menu at the top and all the fonts will drop down for you to choose from. It is also simple to edit the text that comes with the pre-made templates to fit your custom needs. Just click the lettering and when you see the blinking space start typing or deleting. Want to add additional text to the image? No problem! Just click the Text option on the far left and a new text box will automatically pop up in your image. Then you can select the font you want and write your text. Want to add additional text to the image? 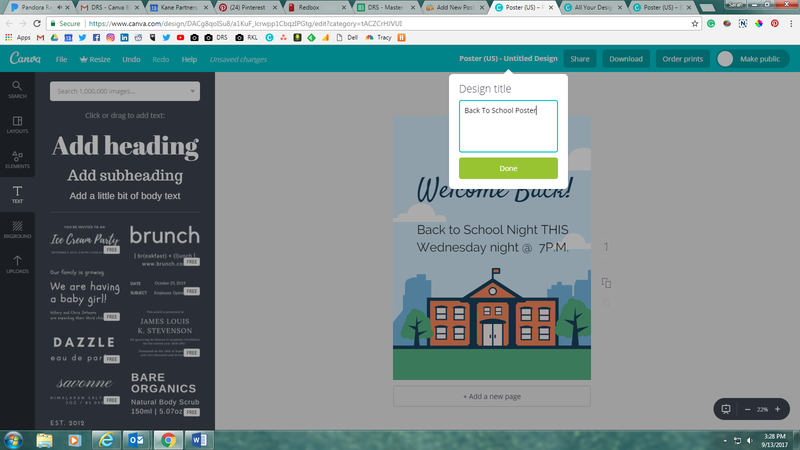 Just click the Text option on the far left and select what you want to add to the design, Heading, Subheading, etc. A new text box will automatically pop up in your image. Then you can select the font you want and write your text. After writing your new text it is simple to change the size of it to fit in your design. Just click the text and then the drop down size menu at the top menu bar. Once you get the design the way you want it make sure to edit the name of the design by clicking the title listed in white above the image, and choose the file name you want it saved as. Next click the download button and choose to save as PDF. Then just send us the file and tell us the specifics of the size, material, and amount you want to be printed. Simple as that. See below for an idea of what it will look like! 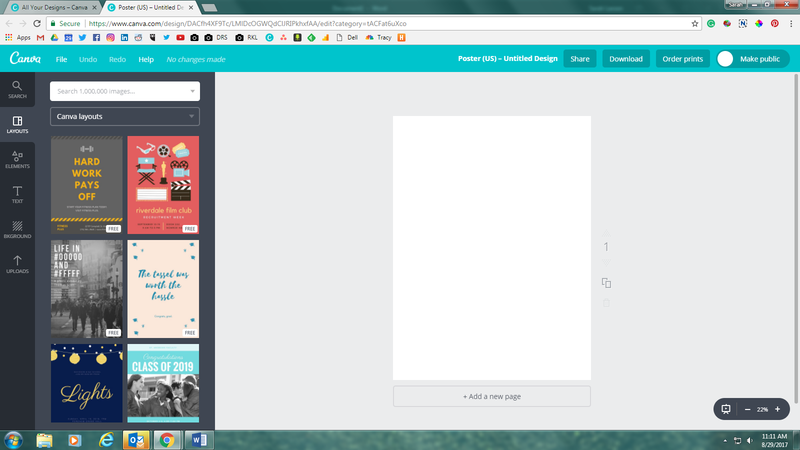 The best part about Canva is that you can be creative, have fun, and get what you need to done efficiently. So, the next time you need a poster printed and start to worry about the cost, design, timing, etc. 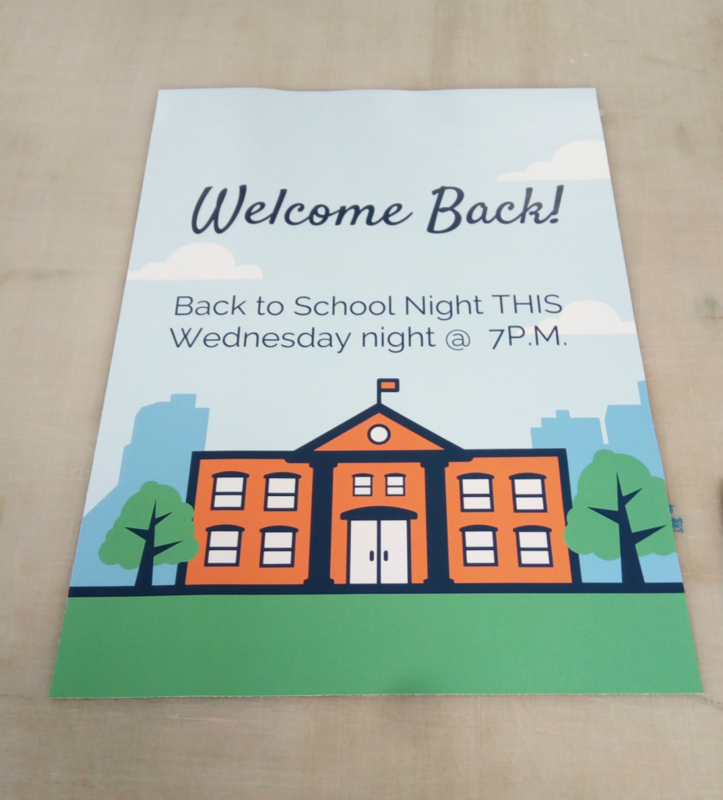 Just log onto Canva and you’ll have a great looking product in no time that we can print for you to make sure everything looks great. Good luck on your future printing project!